The degradation of joints, or arthrosis, is an exceedingly common condition which causes pain in the joints, limp and reduced mobility. The affected joints experience pain as a result of the degradation of the cartilage and bone, which eventually leads to disabilities or deformities. The articular cavity narrows, contours become uneven, articular ends deform, bony deposits start to form and degenerative cysts or cavities may develop. In the majority of the cases the deterioration of the cartilage is caused by a previous condition suffered during childhood or adulthood. The most frequent of these conditions are the lately diagnosed dislocated hip or hip dysplasia, the slipped femoral head or epiphyseolysis, a condition originating from hormonal problems occurring during puberty, diagnosed usually late as well, and joint injuries or inflammations. Among the ailments usually occurring during adulthood the most common are the hip fracture (which, as a result of the unique blood supply characteristics of the femoral head, in certain cases leads to avascular necrosis even if the stabilizing surgery was successful), rheumatism and other articular inflammations, or the necrosis of the femoral head caused by diabetes or overconsumption of alcohol, while it can also occur as a side effect of certain medication or even develop without a recognized cause. It is important to know that while in the majority of cases resting and drug and physiotherapy treatments can ease the patient’s complaints and endurance for a long time, in many cases for real remedy the patient sooner or later has to turn to surgery. GPs usually prescribe some kind of drug treatment, painkillers, anticonvulsants or anti-inflammatory medication. Should the effect of these medicines turn out to be inadequate, the increase of complaints may be delayed with rheumatology or physiotherapy treatment. Time, however, does not heal. The degradation of the cartilage proceeds with varying speed, but proceed it does. The complaints naturally change, usually in line with the weather, state of mind or stress in the workplace, but they all show a gradually worsening tendency. Joint deformities usually develop at the ages between 50 and 60. They are more common in case of women, and their frequency only increases with advancing age. What can we expect from the prosthesis? The main reason of replacing an inflamed joint with an artificial one is to stop the bones rubbing against each other. The pain is caused by this rubbing. The replacement of the painful and inflamed joint with an artificial one provides new articular surface for the joint, wherein the bones can move comfortably without any pain. The objective is to help patients return to the lifestyle they are accustomed to, and thus improve their quality of life with reduced pain and an extended range of motion. After the pain is gone and mobility is restored the patients’ general activeness and everyday actions return to normal, which enables them to attend to their tasks at home as well as at the workplace, thus enhancing their quality of life. In normal circumstances the patients can return to their homes two weeks after the procedure, where they are instructed to perform daily exercises prescribed by their physiotherapists. In case of cemented prosthesis the following limitations should be observed: during the first ten days the patient should first walk with a walker, then later with forearm crutches. Until the sixth week the patient should walk with two crutches, then he should gradually change to only one, while starting with the eighth week he is allowed to switch to walking with a cane. The cane should be used until the patient can walk safely and comfortably without it. It usually means at least six months. In case of uncemented prostheses, the rules are stricter because more time is needed for the prosthesis to integrate properly and become stable. For three months the patient is only allowed to walk with crutches, while further methods of rehabilitation are determined based on medical control. Total endoprosthesis replacements or TEPs are becoming more and more frequent as the population of the world grows older. One or two decades ago the surgery was rarely recommended for people below the age of 60, because the abrasion resistance and safe operation of implanted artificial joints were deemed limited. Improved material quality and developments in surgical techniques over the years, however, made it possible for younger patients to undergo the surgery if their condition demands it. The progress of anaesthesiology and internal medicine and the wide scale experience gained in the field of surgery allows the balancing and safe management of comorbidities, thus preventing them to cause surgical contraindication. The procedure is performed in Hungary since the mid-1960s at orthopaedic and emergency departments. These days the number of prostheses implanted annually amount to thousands. 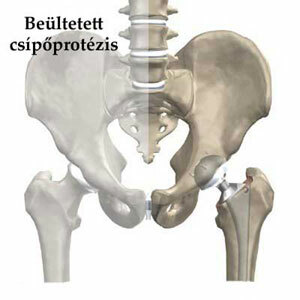 Hip replacement with fixation by acrylic cement can be called classic today since it has been performed for four decades. The main point of this type of implant is that the artificial cup of the femur and its stem, made usually of high-molecular-weight polyethylene, are fixed to its proper place by introducing quick-drying acrylate based adhesive between the bone and the implant. 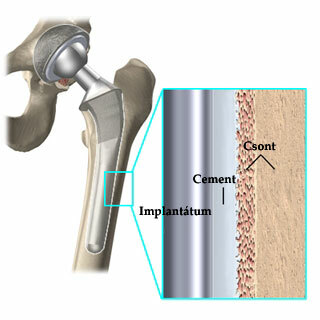 Potential alternatives to bone cement became an issue when it was discovered that if the prosthesis needs replacement caused by laxity on the surface of the cement and the prosthesis, it is difficult to remove the cement set in the bone and even using the most careful method the process can damage the surrounding bone. The uncemented method is generally recommended in surgeries performed on patients of a younger age, since the probability is high for a future revision surgery to replace the prosthesis. The screwless, press-fit method, which is used in case of such prostheses, fits a plastic implant made also of high-molecular-weight polyethylene to a high-tensile metal nest created in the bone socket. The stem is made of different metals and has a rough surface, which is treated with a special porous coat in order to enable the bone tissue to properly fix the implant by growing into the pores. According to experience this fixation needs roughly three months, therefore, that is at least how much rest is necessary after an uncemented hip replacement, which means that the patient should only walk with crutches or a walker during rehabilitation.